Relax is a nice, calm theme that contains 34 icons, a dock, a wallpaper and a lock screen background. One thing to note about this theme is that when you install it, the theme’s iTunes icon does not display…it is in the file, it is just named incorrectly. If you are comfortable with SSH…you can SSH into the Library/Themes/Relax Theme/Icons folder and rename the icon file Itunes to iTunes…then it will show up correctly. Also, the red badge just does not go with this theme…I would have loved to have seen a nice semi-transparent badge (or maybe one that matched a little better!). But, it is still a nice theme that is easy on the eyes! 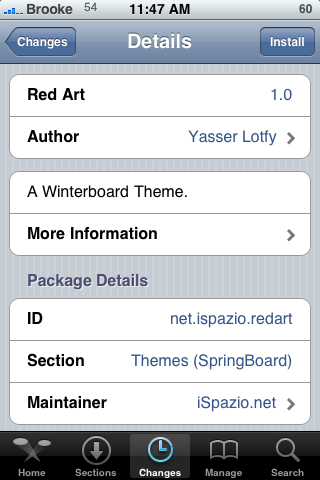 You can get this theme via the iSpazio source. 3. Search for Relax in Cydia, run the install. 4. Open WinterBoard and activate the Relax theme. 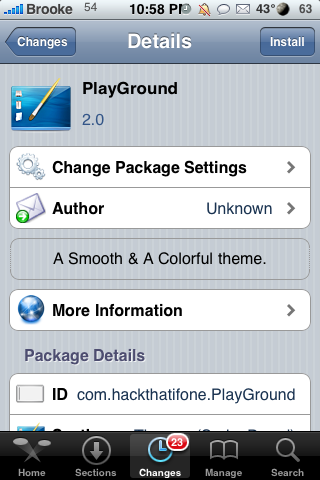 PlayGround is not a new theme for the iPhone and/or iPod Touch…we saw this theme back on the 1.1.4 (and below) firmware. However, it seems it has made it’s way to the 2.x firmware. The theme contains 120 icons (though, once again does not contain an icon for the App Store), a dock and a wallpaper. You can get PlayGround via the iSpazio source. 3. Search for PlayGround in Cydia, run the install. 4. 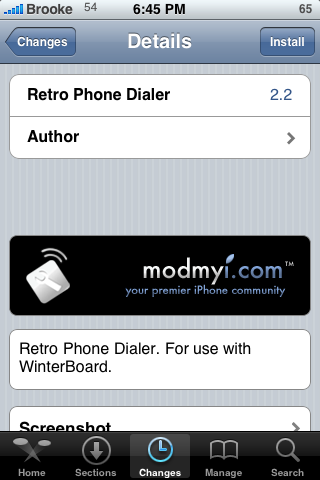 Open WinterBoard and activate the PlayGround theme. 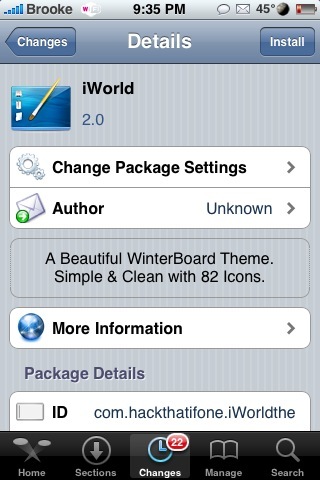 iWorld is a simple theme that includes 83 icons (though, no App Store icon! ), a dock and a wallpaper. This is the type of theme I use when I am looking for something simple, clean and easy to read. And for some reason this theme makes me feel calm…might be a good theme for those stressful days! :) You can get iWorld via the iSpazio source. 3. 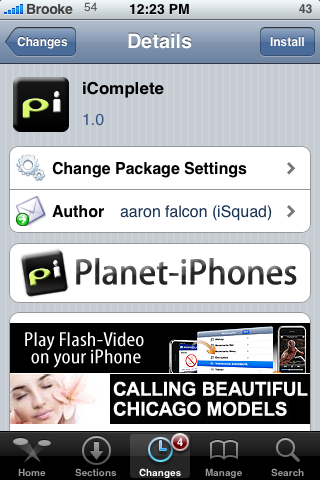 Search for iWorld in Cydia, run the install. 4. 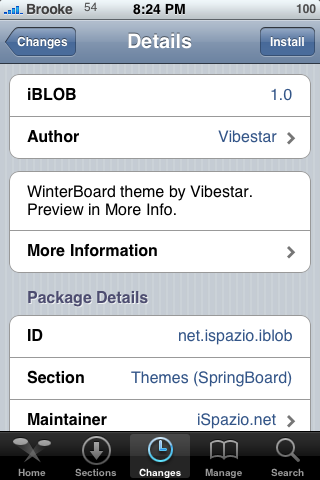 Open WinterBoard and activate the iWorld theme. I recently wrote an article about the themes that are currently available via the MacCiti source. Because the MacCiti source is primarily a themeing source, it also includes a few wallpaper packs. I’m always torn when it comes to wallpaper packs…they are an easy way to get wallpapers onto your iPhone or iPod Touch giving you more modding ability but, I don’t always want to install them because I don’t know what all the wallpapers look like or if I even want all the wallpapers in the pack. So, I thought I would make things a little easier on you and show you what is in each of the four wallpaper packs currently available in the MacCiti source. The four wallpaper packs include; TamsWalls, MacCiti Wallpaper Pack, MacCiti Aura and GH Wallpaper Pack. I recently wrote a post about MacCiti, a new source, which is available for install via Cydia. MacCiti is a theme source which means it contains mostly themes, ringtones and wallpapers. So, I thought I would take a look at what they have to offer.